Royal Mail is celebrating the lives and work of ten prominent Britons with a new set of stamps launched today. 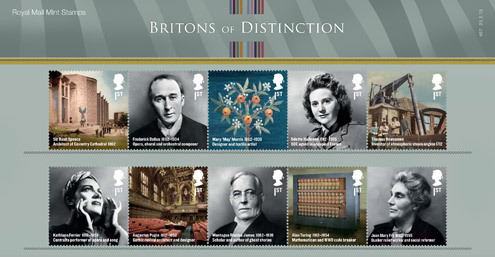 The Britons of Distinction stamps celebrate ten distinguished individuals from the realms of science and technology, architecture, politics and the arts who have all made a major contribution to British society. The ten 1st Class stamps feature a mixture of portraits and images of these individuals and their achievements. Knighted for services to architecture, particularly his designs for the new Coventry Cathedral, opened in 1962, after the original was bombed. The image shows Coventry Cathedral. Yorkshire-born composer of choral and orchestral works. Born in 1862 and most renowned for music evoking a timeless English pastoral idyll. 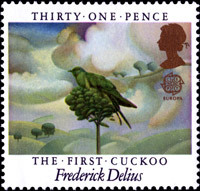 Delius’ The First Cuckoo was commemorated on a stamp in 1985 (pictured right). Textile artist and designer celebrated for her embroidery; daughter of the artist and thinker William Morris (whose work was featured on stamps last year). The image shows Orange Tree, designed and embroidered by May Morris. French-born British secret agent in wartime France, who survived solitary confinement in German concentration camps. Devon ironmonger, engineer and inventor of the atmospheric steam engine, which helped power the Industrial Revolution. His first working engine was installed at a coalmine near Dudley Castle in Staffordshire in 1712. Lancashire-born contralto whose international opera and song career was prematurely ended by her death from cancer. Ferrier worked for the GPO as a telephonist on two occasions, and you can view her nomination papers for 1930 and 1934 on the Ancestry website. Architect, designer and advocate of the Gothic style whose commissions included the interiors of the Palace of Westminster. The stamp shows Pugin’s interior of the Palace of Westminster. Cambridge academic and author of chilling ghost stories, originally written as entertainments for his friends. Mathematician and computer scientist, whose work with the code breakers at Bletchley Park helped to speed up the end of the Second World War. The stamp shows Turing’s Bombe code breaking machine at Bletchley Park. 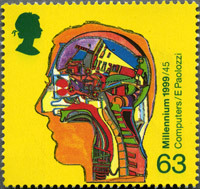 Turing previously featured on a stamp in 1999 (pictured right). Two different pictorial first day of issue postmarks are available. Stamps and stamp products are available at all Post Office branches, online at www.royalmail.com/stamps, the Royal Mail eBay shop and from Royal Mail Tallents House (tel. 08457 641 641), 21 South Gyle Crescent, Edinburgh, EH12 9PB. This entry was posted in Philatelic and tagged Alan Turing, architecture, atmospheric steam engine, Augustus Pugin, Bletchley Park, British Composers, British stamps, Britons of Distinction, composer, Coventry Cathedral, design, dudley castle, Frederick Delius, ghost stories, GPO, Great Britain stamps, handstamps, Industrial Revolution, Joan Mary Fry, Kathleen Ferrier, Mary Morris, miniature sheet, Montague Rhodes James, Odette Hallows, orchestral composer, Palace of Westminster, philately, Quaker, Royal Mail, Sir Basil Spence, social reform, stamps, telephonist, textiles, The First Cuckoo, Thomas Newcomen, William Morris. Bookmark the permalink.